To help you in the continuing fight against the credit crunch, this special offer brings you two items from our highly acclaimed skin care collection - and one of them is totally Free! 'An excellent value-for-money daily moisturiser. Light and delicately scented it combines extracts of organic English Lavender and Rose Otto oils, together with Shea Butter and Aloe Vera to help plump up skin and protect against free radical damage'. 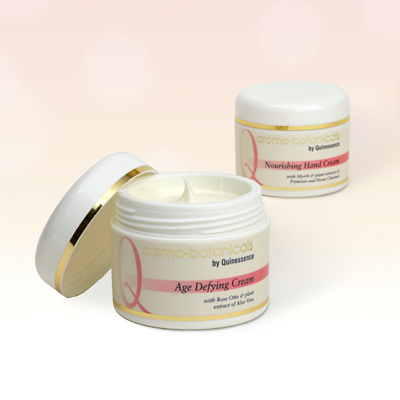 Hold back the hands of time with this revolutionary cream that melts into your skin, delivering essential nutrients to preserve a soft, youthful and radiant complexion. The Aroma-botanicals range Nourishing Hand Cream contains oils of Coconut, Myrrh and Elemi, plus soothing botanicals of Primrose and Horse Chestnut to soothe and deep-condition. This nutrient-rich combination promotes smooth, supple hands and provides effective protection against the environment. But don't delay - we have only 75 jars of Nourishing Hand Cream to give away and when they are gone the offer will end. Claim your FREE Hand Cream now to avoid disappointment.